Offer Terms: Minimum deposit £10. Maximum Bingo Bonus £150, Maximum Slot Bonus £50, 100 Spins @20/day, valid 24 hours on Exclusive slots. Maximum withdrawal £250. Wagering terms apply. Lucky Pants Bingo “Opened its drawers” in 2013. This cheeky brand is unique in the sense that it runs on the Daub Game Platform which is actually owned by Lucky Pants Bingo themselves. This enables a much more enhanced gaming experience offering high definition graphics, and is something a bit different for players to enjoy. One of the most fun features of this particular site is the addition of its Lucky Pants Bingo mascots. 2014 saw the arrival of ‘Betty Balls’ and ‘Luke Pants’. This generous pair can be found popping in and out of the bingo chat rooms handing out free cards, spins and physical prizes. Another great touch to the site is its great start up bonus, of which you can find details via the link above. The great thing about Lucky Pants Bingo too is that the promotions don’t stop there! If you then decide to sign up, 1st, 2nd and 3rd deposit offers all await on both bingo and slots, putting all new players firmly in control of how they like to play. Lucky Pants Bingo also like to create a nice sense of community within the site. With its own tab in the lobby, players can join in the friendly chat rooms, read daily blogs, check out winners stories and also see what’s going on in the Lucky Pants Bingo social media world. The site itself is very inviting and super easy to use, helping players to feel welcome, and at ease. As mentioned before, the new player bonus is not to be missed, and you can find all the details by clicking on the link at the top of the page. Terms and eligibility criteria apply and all players must be aged 18 or over. Lucky Pants Bingo also offer loads of daily, weekend and one off promotions to all players throughout the year, including progressive jackpots and re-deposit bonuses. Win over £2,000 each day with the daily jackpot feast. Each last Friday of the month at 9pm GMT, brings the £10,000 slider. Have a go at some 5 line bingo, with a chance to win up to £10,000. Every Thursday at 9pm GMT, win to open Pandora’s mystery box, with prizes up to £100. Shopping more your thing? Join Shop to Drop every tuesday at 10pm GMT, for your chance to win £100 in retail therapy. Lucky Pants Bingo is regulated by the Alderney Gambling Control Commission. The main types of bingo on offer are styled on the classic 75 and 90-Ball games, but Lucky Pants Bingo also offer a few other variations. Ever tried Swedish bingo? This game is played on a 5×5 grid, giving players more opportunity to win. Fancy a game but in a rush? Then try your luck on some fast paced Turbo bingo. This exciting 2 minute game gives players a new ball every second. There’s also plenty of free bingo on the go every day too! At 10am GMT, players can join the free bingo room to have some fun but without the cost. This is available to all new players, and players who have both funded and wagered £10 during the same day. Be sure to check out the bingo schedule daily though, as lots of other free bingo pops up throughout the week. Alongside all their bingo and slots offerings, Lucky Pants Bingo also has a small, but decent selection of table games and scratch cards. Try your hand at Roulette or Blackjack, or have a go on some of the Scratch 4 series. It’s not a huge selection but they are there and easily found on the homepage if it’s something you fancy giving a go. Lucky Pants Bingo do however offer a huge selection of slots titles, with enough variety to tantalise all you spinners out there. With over 300 titles there is so much choice. Plus, alongside all the popular titles such as Monopoly and Kitty Glitter, Lucky Pants Bingo also boast their own exclusive collection. These include titles such as Lady Luck Deluxe and Wired Birds, and these won’t be found on any other site. 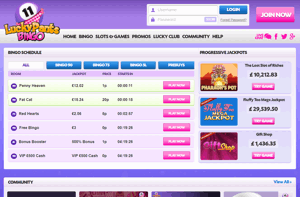 Lucky Pants Bingo offer a variety payment options so that players can choose which ones may suit them best. Please be sure to read all the wagering requirements upon registration as they can change depending on the types of games you play. Lucky Pants Bingo offers up a great platform for some brilliant bingo, side games and slots, all on its own unique network. The promotions are fantastic, varied and ongoing, and players are made to feel welcomed and appreciated with the loyalty rewards and Lucky Club. Although the bingo choices aren’t huge, there are hundreds of slots to try out so its a great site for people who love to try their luck on those. If you’re looking for a site with bags of personality, then get those Lucky Pants out and give this one a whirl.